IT WAS A DARING mission, and Commander Vijay Varma tackled it with clinical precision. He led the team that rescued a pregnant woman—Sajitha Jabil, 25,—from a crowded area glutted with water in Chengamanad in Aluva in Ernakulam district. 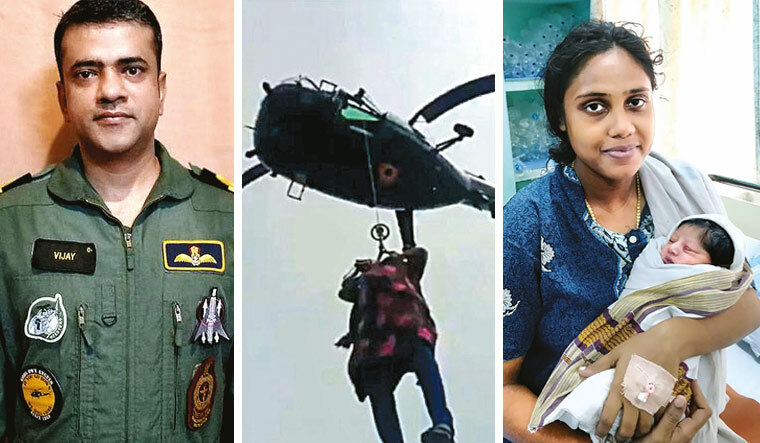 Varma, who belongs to the Angels squadron of the Navy, which operates in INS Garuda in Kochi, piloted a Chetak helicopter to save Sajitha. His team has five Chetaks, to be used for life-saving missions at sea and land. “As we operate in Kerala, my team’s name is God’s Own Angels. We are meant to protect people like angels,” he said. Varma, who had to rescue many others that day, saw Sajitha and the baby after a few days. “I was happy to see her. Though Sajitha was tensed, she cooperated with us and didn’t create any fuss,” he said. Varma said that during such operations, the fuel in the helicopter was kept low. “For, if we fill the tank, it will increase the weight of the helicopter and cause us problems while hovering down,” he said.